Click here to download the schedule of events for this weekend’s Roller Sports Ontario Outdoor Speed Championships. The Ottawa Inline Skating Club was recently featured on local radio show In Town and Out. Read about the interview here; In Town and Out Interview. Its a good listen, and worth sharing with your friends who are on the fence about getting into skating. Last weekend, 200 skaters took part in the Marathon de Montreal. The day’s racing included 42km, 21km, and 8km races. The marathon was part of the NROC series. The race was held in cold & windy conditions. Mississauga’s Peter Doucet & Morgane Echardour were victorious in the men’s & women’s marathon. Make sure you check the results & pictures page for reports, pictures, and videos. Click here to download Montreal’s ‘Le Taz’ schedule from May to September. The Taz is Canada’s newest indoor skate park featuring a 200-meter indoor track with integrated electronic timing. 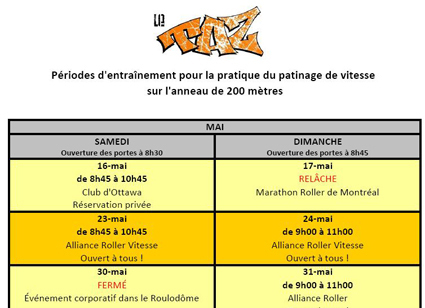 You can also check out Alliance Roller Vitesse and Le Taz’s website for additional information. The 2009 Outdoor RSO Series kicked off its season in Toronto today. The race saw skaters compete in 1500-meter time trial, 500-meter sprint, and a 10km race at the venue that will be used at the upcoming Outdoor Canadian Championships in early July. The 400-meter track at Father Redmond school features wide corners and very smooth surface. Skaters encountered windy & cold conditions.